This 2009 documentary takes viewers to the Pacific Ocean, where a floating mass of plastic has grown to twice the size of Texas. Learn about the origins of plastics and find out where all that plastic waste goes. OROE will be on hand to answer questions about what is recyclable in New York City and to offer advice on waste prevention. Informal tours of the garden’s compost area will also be available upon request. 103rd Street Community Garden (b/t Park and Lex), Thursday, August 27, 8pm (film begins at sunset). Bring your own blanket or lawn chair. One in a series of environmental films during PRdream's Summer Film Fest, now in its 7th year. Join us after work on Friday, August 28 from 5:30 pm - 7:30 pm for a recycling workshop aboard Waterpod™ while it is docked in Staten Island. Don’t miss the opportunity to experience this floating sculpture, mobile art exhibition and living space that demonstrates sustainable technology. Waterpod™ is docked in Staten Island at Richmond Terrace and Lafayette Avenue from August 20th to August 31st. 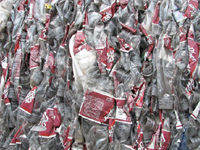 Visit CENYC’s Recycling Events page for more information. 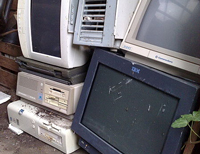 The Lower East Side Ecology Center will sponsor a residential e-waste collection from 10am-4pm on September 12 at Tekserve, 119 West 23rd St New York, NY 10011. Get more info from the LESEC’s website. Get involved with composting in Inwood by joining the Compost Club! Learn about the process of decomposition, bring compostable materials to recycle and take home fresh compost while supplies last. 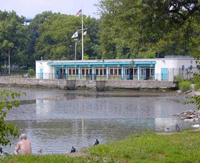 Meets the third Sunday of every month from 10am-12pm at the Nature Center in Inwood Hill Park (enter at W218th and Indian Road). Contact Katy at 212-304-2365 for more info. New weekly drop-off sites for unwanted clothing, linens and other textiles are now open at CENYC’s Greenmarkets in Jackson Heights, Inwood, Fort Greene and McCarren Park. Collections at 97th Street, Union Square (Mon and Sat only), Grand Army Plaza and Tompkins Square markets continue to accept textiles for reuse and recycling. For more information visit www.cenyc.org/clothing. Your donation helps CENYC to Farm, Teach, Grow and Conserve a better New York City! CENYC's OFFICE OF RECYCLING OUTREACH & EDUCATION (OROE) works to improve the City's recycling rate by educating residents about recycling and waste prevention, and working with landlords to make sure building recycling programs are adequate. Our free services include apartment building recycling audits, trainings for tenants and supers, community events centered on education and special collection programs for textiles, electronics, and compost. OROE's current intensive efforts target one-quarter of New York City's residents. Our five borough-wide coordinators work on a community-by-community basis to identify and address the specific challenges to recycling within a Community District. For more information visit www.cenyc.org or call 212-788-7964.